Ohio Slab Jacking & Lifting | T. Luckey Sons Inc. Concrete lifting provides a cost effective and time saving alternative to concrete replacement. 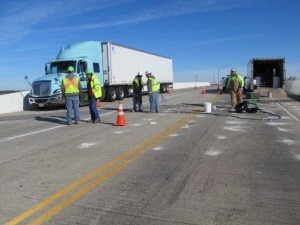 Technicians can underseal, fill voids and lift concrete roadway and bridge approach slabs back to original elevations providing a confident support that’s operational within minutes. As expert slab jacking contractors, T. Luckey has extensive experience in the soil stabilization grouting industry, has perfected the combination of methods and materials to best perform the needed repairs. Our approach begins with understanding and repairing the underlying conditions that caused the settlement and/or unstable supporting base. Once the concrete lifting is completed, the slab or structure is lifted back to original grade and ready for immediate use. Has an installed weight of less than 10-pounds per cubic foot as compared to cement grout with an average weight of 130 pounds per cubic foot. This extreme weight advantage that polyurethane grout has over cement grout virtually eliminates the chances of future settlement due to excess weight of the in-place grout materials. Small 3/8” injection hole size compared with 2.5’ injection holes for cement grouting methods.